-itis - whenever you find a condition ending in –itis, it indicates inflammation. Inflammation causes swelling of the affected tissue, and in this instance if the surface of the nasal passage and throat is swollen, it means that air flow between the nose and lungs is restricted, leading to noisy and/or heavy breathing. The membranes around the eyes are often affected as well. The most common signs of Snuffles include sneezing, a blocked nose or runny nose, tearing from the eyes (which could range from a clear, thin and watery discharge to a thick yellow or green discharge) and difficult breathing. Many times the outer glassy layer of the eye itself, the cornea, may be affected, leading to ulcers of the eye. Sneezing is a very common symptom of this disease and coughing is rare. Similar to colds in humans, viruses are the main cause of this disease in cats with the feline herpesvirus (FHV-1) and feline calicivirus (FCV) being the main culprits. A bacterium with the name Chlamydia Psitacci is also a common cause of the disease. As with most diseases where the surfaces of the body are attacked by organisms which cause infection, as soon as there is inflammation of tissues, other bacteria “join the party”. This illness is highly infectious between cats and can spread quickly from one cat to another. The spread occurs indirectly through the air when the sick cat sneezes, or directly when cats come into contact with the secretions from the eyes and nose of an affected cat. 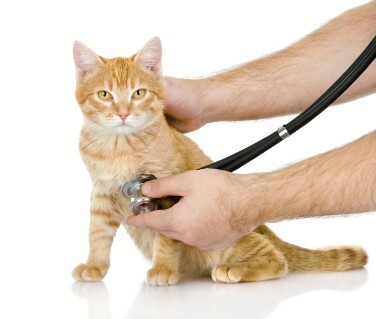 Fortunately the disease does not get transmitted between species so your dog cannot contract the disease from your cat. Infected animals may lose their appetite and become reluctant to eat. This may be due to a fever and feeling poorly in general, but may also be just from a loss of smell due to a blocked nose, which makes food less enticing. For this reason it is advised to offer cats with Snuffles tasty, strong smelling food such as warmed up pilchards. The diagnosis of Snuffles is usually based on the clinical signs. A definitive diagnosis of which viruses or bacteria are causing the disease can be made by sending a swab of the nose or eye discharge to a laboratory for testing. In first time or simple cases of Snuffles it is uncommon for the vet to go to this level of diagnosis upfront because the symptomatic treatment, together with antibiotics depending on the severity of the disease, will be the same regardless of which virus is the main culprit. However, in long-standing or severe cases it will be necessary to perform more in depth diagnostic tests to establish the exact offending organism, its susceptibility to different types of antibiotics and to rule out other potential causes. A cancerous mass in the nasal passages or a foreign body like a grass seed could cause the same symptoms. Other possibilities include fungal infections or dental disease such as infections of teeth roots; or allergic inflammation of the nose. Diagnostic tests for investigating severe or chronic cases of Snuffles may include X-rays; exploration of the nasal passages with an endoscope (a narrow tube with a camera on the end); or a biopsy (cutting a small piece of affected tissue from the affected areas) which will be sent for microscopic examination or culture (an attempt to grow the offending organism in a laboratory and identify its type). Some cats are “chronic snufflers,” which means that they are carriers of the virus. These animals shed the virus and show clinical signs intermittently when under stress. Unfortunately in these cases the only way to confirm such a diagnosis is going through one diagnostic test after another and by a process of elimination, rule out all potential causes. The vet will look for specific signs to try to ascertain the cause of the disease. It is helpful if you can take note of the colour and consistency of the discharge and if it comes from only one eye or nostril, or from both. The vet will also check for any swelling of the face, or any other signs of illness such as weight loss or swollen lymph nodes. The most commonly affected animals are those with a low immunity – usually the very young or the very old. Unvaccinated cats are at a much higher risk as protection against viruses is included in the initial and thereafter annual vaccinations performed by the vet. Vaccination does not guarantee that your cat will not get Snuffles. This is because as with the human vaccine against Influenza, viruses often mutate and have different strains which may not be included in the vaccine yet. The vaccination will however, drastically decrease your cat’s chances of contracting Snuffles, and in many cases also decrease the severity and duration of illness if it is contracted. Regarding kittens, it is important that the mother cat’s vaccinations are up to date, as her immunity is passed down to her offspring. It is also vitally important that the kittens ingest the mother’s colostrum in their first few hours of life. Colostrum is the first milk produced after giving birth and it is rich in antibodies, which the kittens are able to absorb directly for the first 24 hours after birth. The lining of the intestines of new born animals start changing within six hours after birth and if colostrum is not taken in within those first hours, the kittens have a much weaker immune system and protection against many infections. Round about six to eight weeks of age, this passive immunity which kittens got from their mother starts to wane, and at this stage it is necessary to have the kitten vaccinated by the vet for the first time, to be followed up by two or three follow up booster vaccinations with monthly intervals. Yearly vaccination boosters thereafter will depend on the risk as assessed by the vet. Besides low immunity, other risk factors for Snuffles include crowded conditions; poor ventilation and hygiene; inadequate nutrition; pregnancy; lactation; the presence of another disease or high stress levels. Treatment of viral infections is largely symptomatic. The cat must be provided with a comfortable environment, preferably indoors and warm. It is helpful if the owner can gently wipe away eye and nose secretions every few hours. An amino acid supplement called Lysine helps to limit multiplication of the virus in affected cases. This can be provided in a paste form by the veterinarian. Antibiotics are used if a secondary bacterial infection is present or suspected. Decongestants and eye drops may also be necessary depending on the case. It is important to encourage sick cats to eat. Tasty foods must be offered, and an appetite stimulant can be used. In severe cases, anorexic cats (cats that have stopped eating) may require intravenous fluids or even a stomach tube. Nebulisation which is a process where medical solutions and suspensions are broken up into small aerosol droplets which can be inhaled from a medical device, can be used to treat affected cats. Most cats do not tolerate this treatment well and it is usually reserved for severely ill cats. Sick cats should be isolated to limit the spread of the disease. Most cases of Snuffles are self-limiting which means that with time the cat will overcome the illness as its own immune system fights back and forms antibodies against the viruses, or the body’s soldier cells kill off offending bacteria. Occasionally, in severely compromised patients, the disease can be fatal. Chronic Snuffles is a severely debilitating disease and treatment can be frustrating because of frequent relapses as well as antibiotic resistance building up over time, leading to fewer treatment options. As is the case with all diseases, prevention is better than cure. Timely vaccination of all cats will go a long way in decreasing the prevalence of Snuffles. A healthy living environment with minimal stress is also advised. If your cat does start showing signs of Snuffles it is best to take your cat to the vet as soon as possible for assessment and appropriate supportive care.